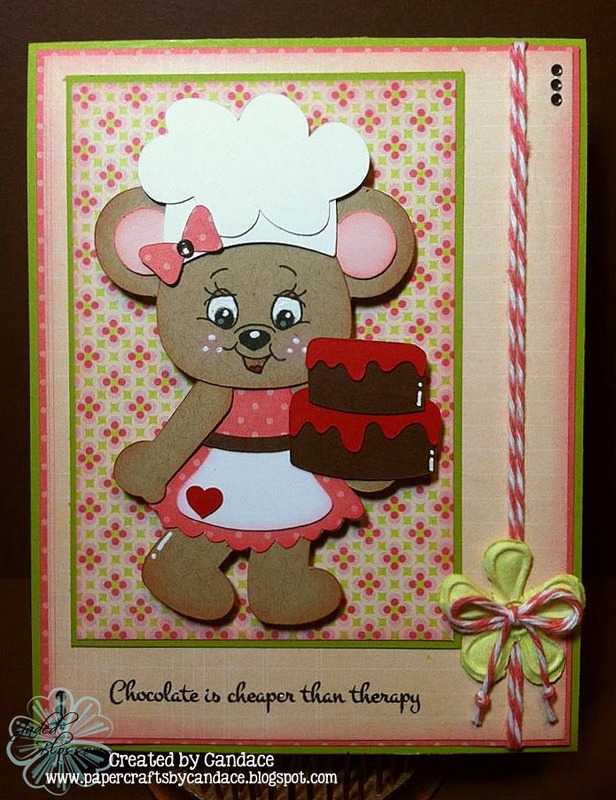 Paper Crafts by Candace: Chocolate is cheaper than therapy! Hi Everyone! Today I am sharing with you a card I created using the new Jaded Blossom "Chocolate Lovers" stamp set! Chef Mouse SVG: Scrapping Bugs Designs "Loving from the Oven"
Mouse Face: Peachy Keen: "Wide Eyed and Bushy Tailed"
Sentiment: Jaded Blossom "Chocolate Lovers"
I attached the mouse to the card using pop dots. I am entering this card in to this weeks Peachy Keen challenge "Just Cards, Popped Up"
Awwwwwwe this is so cute. omg this is sooo cute!!! This is so CUTE!!!! Love it. This mouse is ADORABLE! Very cute card Candace! Thanks for sharing! Oh My Gosh!! How adorable!! Super cute mouse!! Super cute! I think I will go get some chocolate now :) Congrats on the Top 3 pick!